Why We Need a Snap History Eraser for iPhone? Snapchat is perhaps the most well-known and the most used picture sharing app today. Almost every one of us have used or are using Snapchat at some points in our lives. Undoubtedly, it is a very unique app that provides users an innovative way to share photos and reach their loved ones. However, Snapchat has its own problems that are often overlooked. One such problem is concerned with privacy. As a social app that promise no privacy leak, does it really do what it promise? Why still increasing users look for Snap history eraser? Snapchat, has a different type of controversy altogether. Is Snapchat Safe? Will It Lead to Privacy Leakage? The most primary issue surrounding Snapchat is around its safety. This is in terms of whether the photos that are deleted after a certain time limit are actually deleted or still remain in the system. According to a forensic researcher, the photos and messages that are sent or received through Snapchat are not actually deleted. What really happens is that the app simply changes the label of the photos so that they are not detected by the respective operating system. Hence, it is true to assume that the deleted photos and messages can be reconstructed and traced back to the user who is the originator of these photos. Therefore, the photos can be retrieved and used illegally. Snapchat is a very popular app and hence it becomes the primary target of hackers and criminals alike. Given the danger surrounding Snapchat, it only makes sense to take certain precautionary measures in order to remain safe from unwanted infiltration of privacy. So what can be done in order to ensure your privacy when using Snapchat? Well, deleting photos that the operating system cannot detect is really a difficult thing to do. In fact, it is almost impossible to delete such photos given the conventional ways of deleting. As such, the answer to the question lies in a specialized software that lets you conveniently erase such private files in a couple of clicks without any hassle. 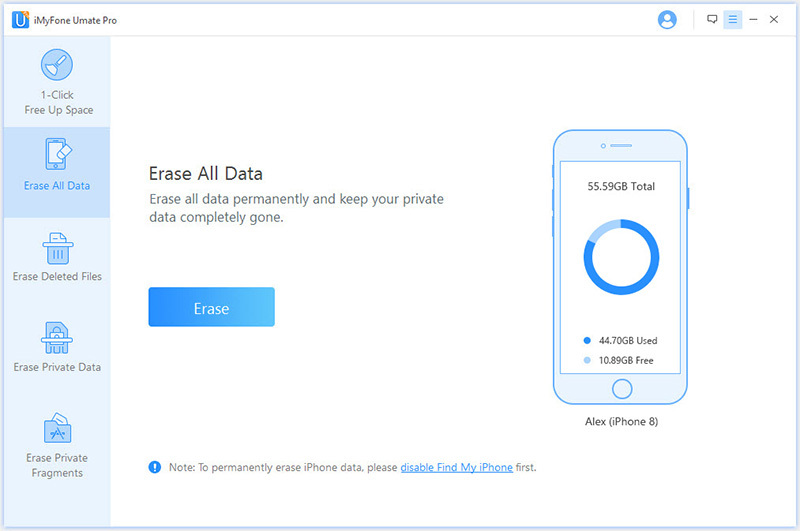 One such app is iMyFone Snap History Eraser ( or the Mac version) for iPhone/iPad, which is a professional iOS data erasing tool that can erase such photos and messages without any trouble. 100% Unrecoverable: Its unique and robust features allow you to delete photos in a jiffy ensuring complete privacy and safety. The photos erased as such are 100% unrecoverable. Erase SnapChat Photos: iMyFone Snap History Eraser allows you to erase SnapChat photos without any chance to recovery. Erase Snap Fragments: You can erase snap fragments along with incomplete and private fragments. In addition, you can erase corrupted snap files so as to ensure your iPhone is safe. iOS Tune-up: Unnecessary files such as temporary files, junk files, app caches and a lot more can be deleted in bulk to save a significant amount of storage space and tune up your iPhone performance -- free trial. iMyFone also received positive feedback from Mukeuseof.com, iPhoneinCanada.com, Macbed.com. This Snap history eraser iPhone has a very easy-to-use interface making it a very utilitarian app in the market, it let you perform a variety of tasks with ease. How to use this Snap History Eraser? Step 1: Launch iMyFone Snap History Eraser and connect your device to the computer. Step 3: Type in “delete” to confirm and click “Erase Now”. The software will start erasing your SnapChat data. Is Snap History Eraser Safe? Yes. Applied with advanced overwriting technologies, iMyFone Snap history eraser is safe enough to protect your from privacy leak. 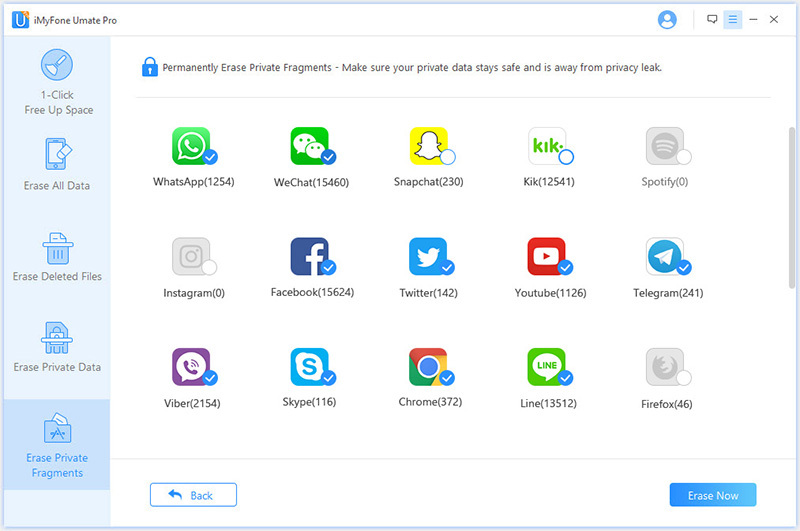 The traditional way of deleting just remove the Snapchat data from iPhone but not from its hard drive, which is also true for WhatsApp, Facebook, Line, and other apps. However, the Snap history eraser destroy the data stored on hard drive by complete overwriting. In other words, there is no trace related to the original data that no recovery tool can retrieve to it again. Therefore, in order not to be involved in Snapchat privacy leakage, you should use Snap history eraser.